So, your horse is limping! What can you do to address the problem and how should you go about it? It is in your best interest as a horse owner, to take prompt action any time you have the least suspicion that something is not right with your horse, especially when it comes to any indications of lameness. Careful observation is the key to identifying what is causing the lameness. When your horse is lame, it is important to follow up with any treatment your farrier or veterinarian recommends. 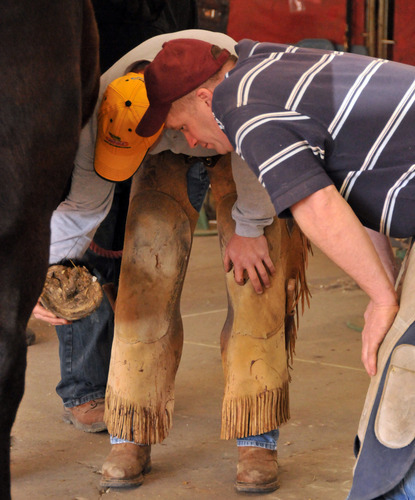 By using your eyes and your hands as you examine your horse and observe your horse in action, you may be able to locate the cause of the lameness. 4. Check the neck and back for symmetry, posture, and contour. Are there any changes in range of motion? Your objective is to determine which leg is affected or if more than one leg is affected. Also, does the problem originate in the leg, or does it originate in the horse's neck, or back? A surprising majority of lamenesses involve the foot. 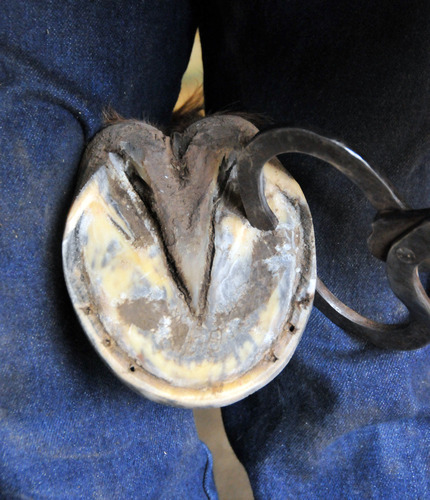 The farrier can can often diagnose and correct a lameness causing condition of the foot. If the problem appears to be related to the horse's lower limbs, feet, or hooves, a farrier may be able to diagnose the problem and provide corrective treatment. 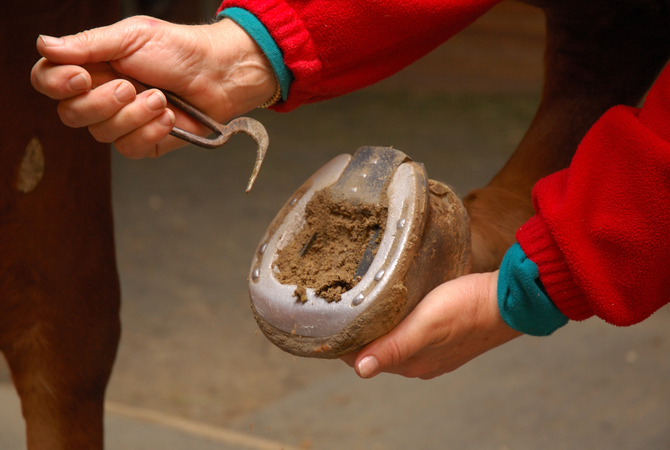 Using a hoof tester, your farrier can check for trouble spots in the foot and hoof along with noting any puncture or other kinds of wounds, diseases of the frog, heat, swelling and increased pulse that indicate infection, disease, or injury. In some cases, such as white line disease (seedy toe) and puncture wounds of the white line, the farrier will pare out diseased horn and unsound tissue, pack the cavity with betadine dressing and treat the hoof until healthy horn begins to develop. Prosthetic hoof repair material and special shoeing techniques are used while making sure that any predisposing conditions are treated and corrected. Doing an evaluation of the horse in motion with particular attention paid to any deviations in gait, failure to use all four feet in sync, unnatural shifting of weight from one limb to another, head bobbing, stiffness, shortening of stride, and irregular hoof placement. Part of the evaluation includes the veterinarian holding each of the horse's limbs in a flexed position, then releasing the leg. As the horse trots away, the veterinarian watches for signs of pain, weight shifting, or irregular movement. Completing a physical examination of the horse using palpation and manipulation of muscles, joints, bones, and tendons, joint flexion tests, and application of hoof testers to reveal evidence of injury or stress. The physical examination will also appraise conformation, weight-bearing, and balance. Drawing blood for tests to detect drugs that may camouflage lameness or that might contribute to the lameness and to determine if the horse has other conditions that might contribute to or affect lameness. Radiographs/X-rays to identify damage or changes in bony structures. Analgesic techniques, including diagnostic regional nerve and joint blocks, to identify the location of the injury or stress that is causing the lameness. Working from the foot up, the veterinarian temporarily deadens sensation in specific parts of the limb, one joint at a time, until the lameness disappears. This procedure isolates the area of pain causing the lameness and also helps determine whether the condition is treatable. Ultrasonography, nuclear scintigraphy (bone scan), or magnetic resonance imaging (MRI) to look for soft-tissue problems involving tendons, ligaments, joint surfaces, and muscle tissue. Computer tomography (CT) may be used for both tissue and bone problems. Arthroscopy to allow for an optical examination of internal joint tissues or tendon sheaths. Arthroscopy requires general anesthesia, but may be the only way to fully determine the damage. Samples of blood, synovial (joint) fluid, and tissue samples taken for examination to determine if infection or inflammation are present. These tests usually require laboratory evaluation before results are available.